← U.S. Arms Sales to Taiwan: Capitulation to a Rising China? 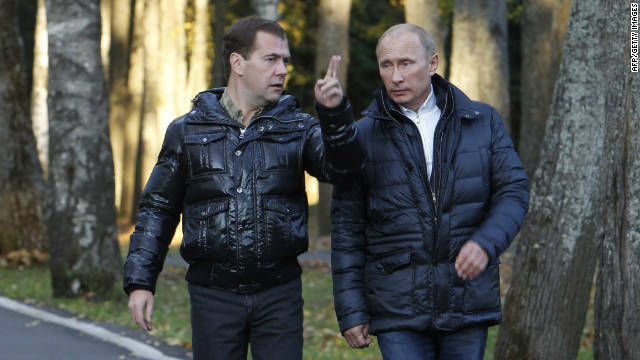 Russian Prime Minister Vladimir Putin and President Dmitry Medvedev are set to swap positions (again) in 2012. The announcement that former Russian president (and current prime minister) Vladimir Putin plans to assume the presidency again in 2012–a position he can legally hold for up to 12 more years–has provoked a flurry of reponses from political analysts. Some have expressed surprise and consternation, while others contend this is simply Russian politics as usual. But these analysts all agree that there is a considerable gap between Russia’s pretensions as a liberal democracy and the reality of how the Kremlin exercises power. (See the recent discussion, in this blog, of illiberal democracy). Indeed, Putin’s dominance in recent years bears little resemblance to the distribution of power as envisioned by the constitution. The Russian constitution invests the president with great authority and the prime minister with little power, yet when Putin relinquished the presidency in 2008 and became prime minister, it was Putin who remained the dominant figure. Russia therefore provides a vivid example of a common phenomenon in politics: the gap between formal structures, as codified in documents like constitutions or organizational charts, and actual political behavior. It was precisely this gap that motivated scholars to move from traditional political science (largely concerned with the study of formal documents like constitutions) to behavioral political science (focused on the empirical discovery of patterns of political behavior). This “behavioral revolution” occurred in the 1950s and 1960s and behavioralism has become the dominant approach among today’s political scientists. Behavioral political science has been criticized for its lack of concern with normative questions and its allegedly foolhardy efforts to discern lawlike generalizations about inherently unpredictable human behavior, but few would question the fact that its emphasis on actual political behavior has produced important advances over the traditional mode of inquiry. What other examples of the gap between formal structures and empirical behavior can you identify? Is the traditional approach to political science of any value today? What are the shortcomings of the behavioral approach? This entry was posted in Uncategorized and tagged behavioralism, Dmitri Medvedev, political science, Russia, Vladimir Putin. Bookmark the permalink.